The Cypress water filtration system utilizes three separate advanced water filters, dramatically reducing industrial chemicals, pesticides, herbicides, turbidity, volatile organic compounds (VOCs), microorganisms, and bad tastes and odors. Reduce harmful chemicals like atrazine; chlorobenzene; methoxychlor; endrin; benzine; DBCP and aesthetic chlorine from your tap water for a healthier home and family. The H2O+ Cypress installs in under 10 minutes with the provided faucet diverter and fits 99% of home faucets. Alternatively, you can install the water connection under your sink with an available T-valve (sold separately). Stage 1: COMPOSITE PLUS FILTER (HF-31):This two-step filter reduces particulate materials such as sand, rust, and fine particles from the water supply. This first filter also acts as a pre-filter protecting the 2 following filters. Recommended replacement every six months. Stage 2: NANOTRAP FILTER (HF-32): This specialized, patented, and innovative nanotechnology filter is made with 100% USA-sourced materials (including nano alumina & cellulose fibers with a pore size of 2 micron (2 µm)) that reduce turbidity, harmful waterborne microorganisms (including many bacteria and viruses), as well as numerous particulates. Recommended replacement is every 12 months. Stage 3: CARBON BLOCK FILTER (HF-33): As the final stage in the filtration process, the carbon block filter further reduces particulates, bad tastes and odors, and water contaminants such as chlorine and volatile organic compounds (VOCs), improving the taste of the dispensed water. Recommended replacement is every six months. 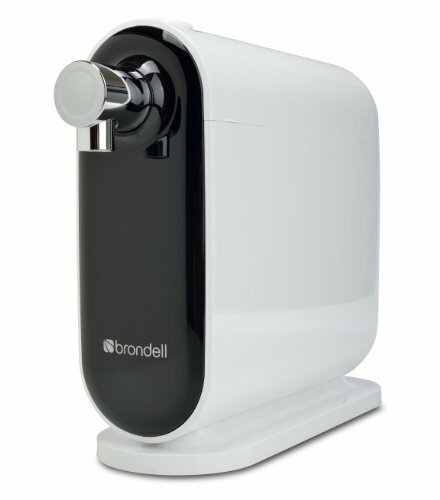 Brondell H2O+ water filtration systems are all tested and certified by the Water Quality Association (WQA). Beware of non-certified manufacturer’s filtration claims that have not been tested and approved by an authorized agency for water filtration products.